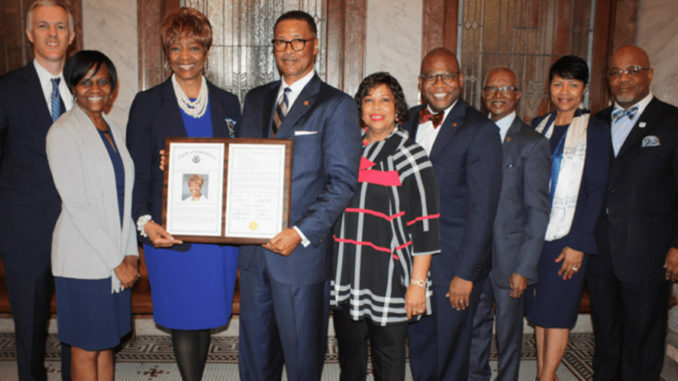 Jackson State University National Alumni President Dr. Earlexia M. Norwood, MD, of Detroit, Mich., was honored by the Mississippi Senate with presentation of Senate Concurrent Resolution 534 commending her professional and community successes while growing JSU’s alumni following. Dr. Norwood is a native of Jackson, Mississippi, and is the first Jackson State University National Alumni president in many years who is from the city of Jackson. Dr. Norwood is a board-certified family medicine physician, who has practiced at Henry Ford Health System (HFHS) since 1993. She seeks partnerships and alliances to make Detroit the healthiest city in the country, as well as opportunities to educate communities and organizations on health and wellness. She is currently the service chief of Family Medicine for Henry Ford West Bloomfield Hospital, director of Practice Development and Community Health Education, ambassador for Healthcare Equity and Global Health ambassador for the Breaking Walls Organization. Dr. Norwood is an assistant clinical professor for Wayne State University School of Medicine and serves on the Multicultural Leadership Committee for the American Heart Association, among many other honors.